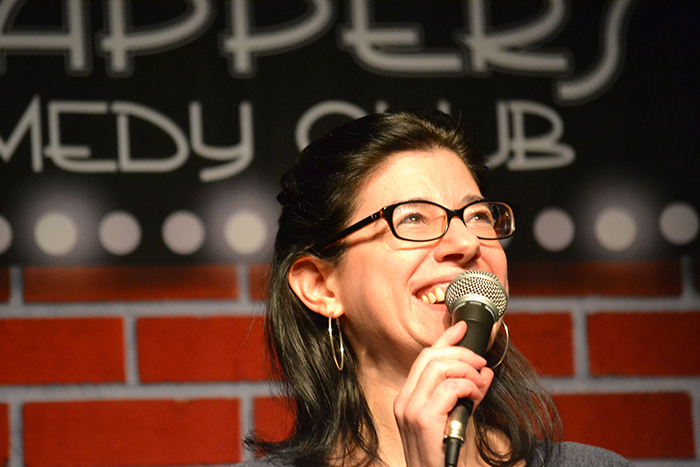 Dana Eagle is not your run-of-the-mill comedian. For instance, we assume very few comedians have had the opportunity to be on the receiving end of the legendary Roseanne Barr saying she wants to “hear more about you, growing up and becoming the odd person that you are,” in front of millions of viewers across the world. Dana already has that under her comedic belt. 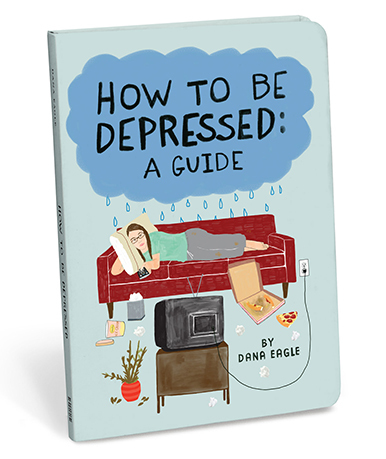 How to Be Depressed: A Guide by Dana Eagle is now available at Knock Knock and Amazon. The Last Comic Standing veteran and author of How to Be Depressed: A Guide has been a stand-up comedian for over fifteen years. Her no-frills, fearless humor encompasses topics like her LGBTQ lifestyle, her personal struggles with depression and mental health, and even her recent battle with lymphoma. Also, throughout her comedy tenure, she’s performed shows with the likes of Bill Maher, Maria Bamford, and literally brought laughter to troops in war zones, including Iraq in 2007. 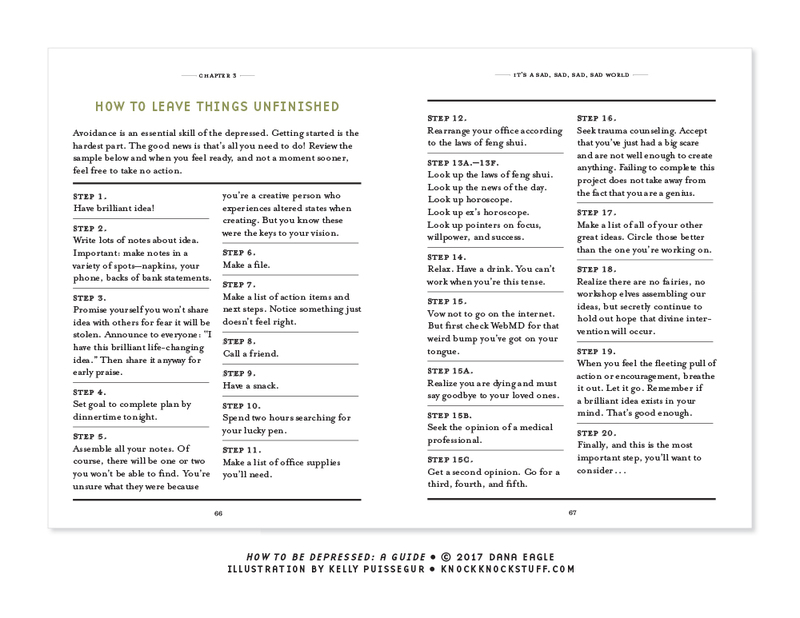 Dana’s How to Be Depressed: A Guide shares wry wisdom, and “therapeutic” activities like finding your “depressed pose” and filling out a bad-poetry generator. Most importantly, the book teaches how expressing yourself and using humor can make depression feel more bearable. Typically, I’m more reserved than people would expect, certainly more than what’s on stage when I’m performing stand-up. But once I’m comfortable, I can be “spirited” or, as others may choose to refer to it, “annoying.” But I guess some of my quips were sharp enough that a couple of people pulled me aside and said, “You should give it a shot.” A few months after I returned home, I took a class and ever since, the singing stays in the shower. 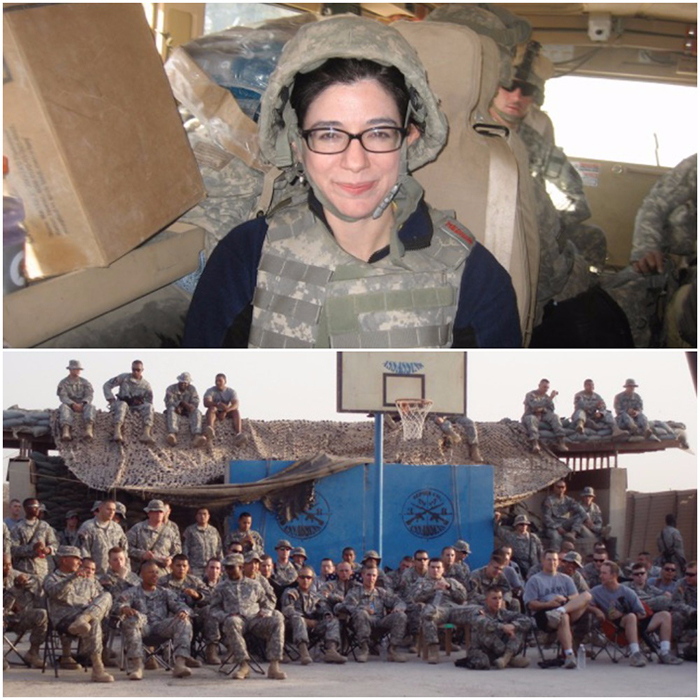 Top: Dana in military uniform; Bottom: Soldiers in Iraq waiting in 110-degree heat for Dana’s evening show to begin. Check the flights before you accept the gig. Never leave the stage empty (wait for the emcee to return). Don’t take jokes from my father. Don’t ask, “Is this funny?” Just slip it into the conversation and see how it works. Get a comedy buddy to bounce things off of. Finally, there are only two parts to a joke: the set-up and the punch line. The first part is written for you. You have one job. Oh, and check your fly. 3. Other hobbies outside of stand-up and writing? I belong to a book club that would probably be more accurately described as a drinking club that orders books. You’re welcome, Amazon. I don’t live a jet-setting life but stand-up has afforded me some wonderful travel (and some not-so-wonderful travel) as well as plenty of new experiences. 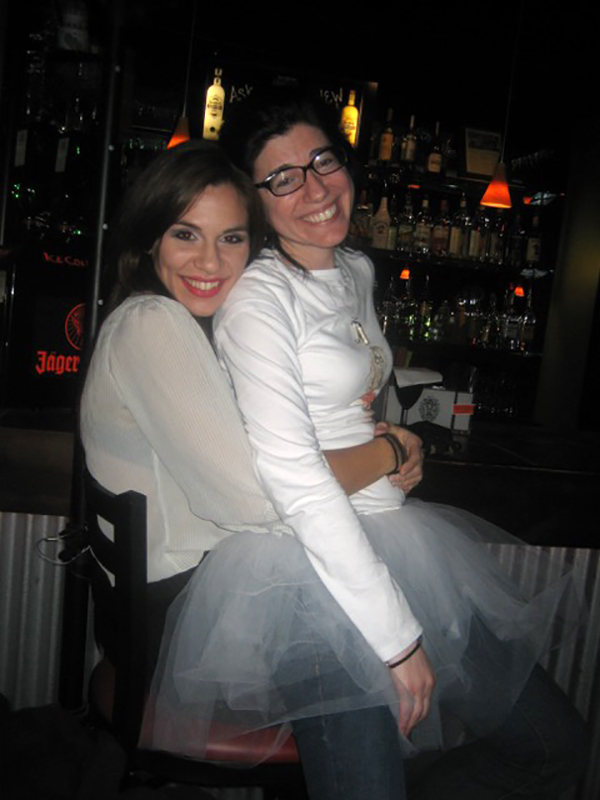 My “time off” is about being with friends in ordinary ways. I suppose I’m a little backward like that. Dana on the road. 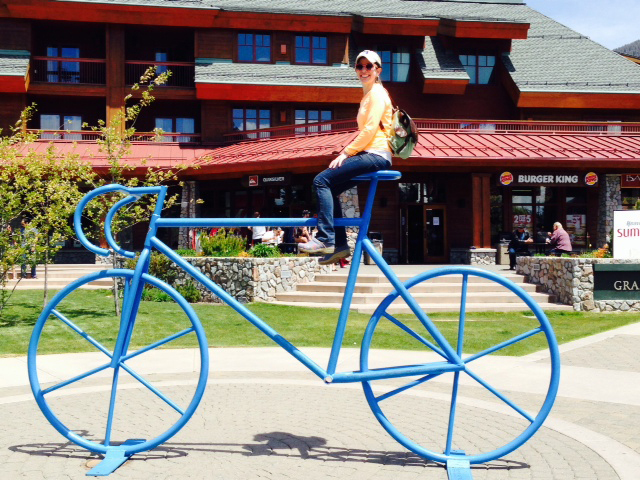 This stop: Tahoe! Around town, my sets are a mix. Often I have the club light me halfway through so I can use the second half for new material. I generally prefer working on stand-up after a show. It’s quiet. I like heading to an all-night diner and sitting with my notes. Dana relaxing with a friend. And finally, if I may offer one last strategy: For a period of time, when my health insurance was unable to provide . . . well, let’s just say they were fined by the state, I used this website. There’s nothing to buy, no memberships, no gurus to worship. It simply offers information and simple strategies that address the different types of automatic thinking associated with depression and other mental health issues. To this day, I still visit the “Solutions” section and print out a couple of worksheets for myself. 6. Favorite Knock Knock item (besides your book) and why? Inconsequential Dilemmas is engaging, funny, and a terrific group read. 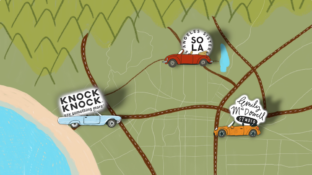 It feels like one of those games we played in the car before there were iPads. But now I see that there’s Consequential Dilemmas so check back because that might top it. 7. What are 3 things on your bucket list right now? No bucket list. There’s now, next week, and a few things I’d like to try (like tightrope walking) but if I don’t, then I’m good with what’s on the agenda. Check out Dana’s upcoming shows, and keep up with Dana on Twitter @DanaEagleTweets and Instagram @DanaEagle. All photos by Dana Eagle. Love reading about you and your comedian adventures.